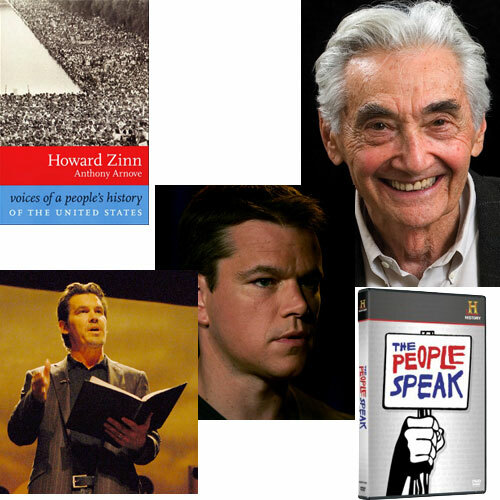 One of my favorite experiences during the two years I spent as a copywriter at Amazon was creating an opportunity to interview Howard Zinn—I forget what publishing rationale prompted me to make the call, but since I was already a fan, I was thrilled to speak with him for something like 30 minutes. I remember we talked about the efforts to impeach Bill Clinton, and how it was all classic “bread and circuses,” and we talked a little bit about the boost he’d gotten from Matt Damon’s mention of A People’s History of the United States in Good Will Hunting. Two of my favorite moments in the film were Brolin reading a passage from Dalton Trumbo’s Johnny Got His Gun, one of the most blunt anti-war novels ever written (which Trumbo would later turn into an equally powerful movie) and Damon reading the famous “I’ll be there” passage from Steinbeck’s The Grapes of Wrath. But there’s a lot else to admire in this documentary—and I believe there will also be a CD version as well, which actually makes a little more sense as these are statements that should be listened to carefully, and separating them out from the (fairly static) visual presentation may make that a bit easier for some. Got a note from Beatrice guest author Meg Wolitzer this morning about next Sunday’s premiere of the CBS TV-movie based on her novel Surrender, Dorothy, which is not to be confused with the 1998 film Surrender Dorothy, especially since it’s doubtful that Diane Keaton and Peter Riegert would star in a film about transvestite submission. So if you’re all bowl-gamed out by 9 p.m. Eastern on January 1st, now you’ve got something else to watch. Quite a day for Meg, as it turns out she’s also featured in Tuesday’s NYT arts section for her participation in Amazon Connect, the online retailer’s bid to help writers take advantage of blog technology and communicate more directly with readers.